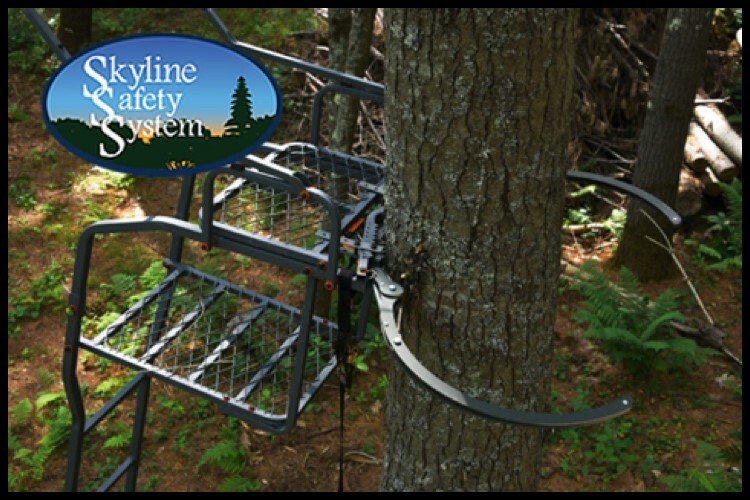 Skyline Safety System is redefining treestand safety! Our revolutionary Safety System could be the fastest and safest way to enter a treestand whether it be a ladder stand or a hang-on stand with the use of our Sticks. The Patented Skyline Safety System is made of lightweight high strength aluminum with two pivot arms that close using a pulley system and ratchet strap. You simply mount the Skyline Safety System on your ladder stands back-bar with the included Universal Mounting Kit, secure the tree bracket around the tree and place the stand up against the tree. The ratchet strap closes the pivot arms tight around the tree allowing you to secure your stand prior to stepping of the ground. This will eliminate what I call the “Death Crawl”everybody’s familiar with it, it’s where you place your ladder stand against the tree and inch your way up hoping it doesn’t fall before you can secure it at the top. Skyline Safety System LSM mounts to most ladder stands’ back-bar and will allow you to secure your ladder stand prior to stepping off the ground. The pantented Skyline Safety System is made of lightweight high-strength aluminum, with two pivot arms that close using a pulley system and rachet strap. You simply mount the Skyline Safetty System LSM on your ladder stand with the included universal mounting kit, secure the tree bracket around the tree and place the stand up against the tree. The rachet strap closes the pivot arms tight around the tree, allowing you to secure your stand prior to ever stepping off the ground. This could be the safest and fastest way to place a hang on stand, effortlessly allowing you to climb 18’. 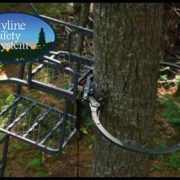 The Skyline Safety Sticks comes with the patented Skyline Safety System that mounts to the top section of the ladder allowing you to be secured to the tree prior to stepping off the ground. The heavy duty ladder sections offer alternating angled steps which feature nonskid slip resistant coatings. Assembles easily, the heavy duty ratchet strap closes the pivot arms tight around the tree allowing you to secure your sticks to the tree prior to stepping of the ground. We also offer a lifeline securing system that allows you to safely secure your lifeline to the tree prior to stepping off the ground. The heavy-duty Skyline Lifeline allows you to be secured to the tree prior to stepping off the ground. The rope includes a sliding Prusik knot that attaches to your carabiner and harness. Why pay for more rope than you need? At 24’ the Skyline Lifeline saves you money by not paying for a section of rope that typically sets on the ground. The lifeline also features “Hi-Vis” sections of rope that allows for easy access in low light conditions.